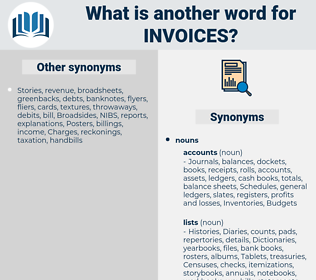 What is another word for invoices? transactions, transaction, transactional, payment, payments, claims. 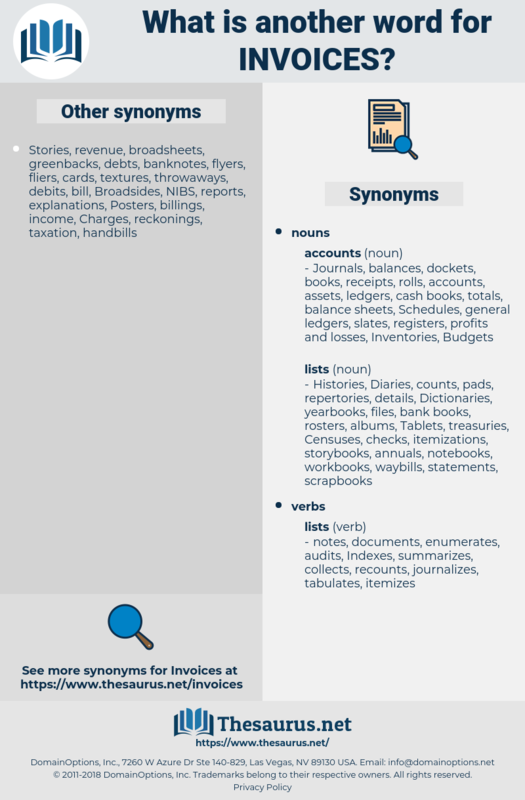 Instrumentalities, receipts, Coins, documents, pieces, calculations, vouchers, certificates, Expenditures, Records, costs, alternatives, instruments, billings, deposits, notes, statements, scores, payable, expenses, Fees, Charges, things, counts, numbers, exhibits, accounts, tariffs, readings, Ones, books, rooms, Surveys, amounts, parts, utilities, Las, Plays, payments, claims. And in the afternoon, so when I sat down to make out invoices, I wrote automatically the names of the familiar customers, my mind now exalted by hope, now depressed by anxiety.